Kenneth Atkinson: aged 47, of Cranbrook Road, Wheatley, theft, failed to surrender to custody, failed to comply with supervision requirements following a period in prison, 42 days in prison, £115 costs. Peter Alexandre Munroe: aged 47, of Zetland Road, Wheatley Hills, assault, community order, rehabilitation activity requirement, unpaid work requirement, restraining order imposed, £100 compensation, £185 costs. Trevor Mallinder: aged 64, of Simpson Place, Mexborough, production of a class B drug, £153 fine, £115 costs, order for destruction of the drug. Jaime Malcolm Wilmot: aged 39, of Coronach Way, Rossington, resisted a police constable in the execution of their duty, assault, community order, alcohol treatment requirement, rehabilitation activity requirement, unpaid work requirement, £200 compensation, £185 costs. Alex Shaun Titley: aged 30, of Jarratt Street, Hyde Park, drink driving, driving without insurance, failed to stop when asked to do so by a police officer, £240 fine, £115 costs, disqualified from obtaining a driving licence for 17 months. Lee Chadbourne: aged 30, of Balfour Road, Bentley, drunk and disorderly, assaulted a police officer in the execution of their duty, community order, unpaid work requirement, £200 compensation, £170 costs. Matthew Ryan Fennell: aged 25, of Churchfield Road, Campsall, failed to comply with an order under the Anti-Social, Behaviour, Crime and Policing Act 2014, discharged conditionally for 12 months, £105 costs. Danny Hayes: aged 25, of Dearne Road, Bolton-upon-Dearne, drug driving, £280 fine, £115 costs, disqualified from obtaining a driving licence for 12 months. Elye Jordan: aged 21, of Whitelee Road, Mexborough, drunk and disorderly, assaulted a police constable in the execution of their duty, community order, curfew requirement with electronic monitoring, £150 compensation, £170 costs. Daniel Andrew McGuffie: aged 28, of Staveley Street, Edlington, using abusive language or behaviour to cause alarm and distress, discharged conditionally for 12 months, £105 costs. David Szmaglinski: aged 31, of Carr Hill, Balby, drink driving, £320 fine, £115 costs, disqualified from obtaining a driving licence for 12 months. Adam Rivett: aged 29, of Glyn Avenue, Town Centre, theft, £50 fine, £115 costs. Barry Trevor Gerrad Erskine: aged 39, of Westholme Road, Balby, drink driving, community order, unpaid work requirement, £170 costs, disqualified from obtaining a driving licence for 24 months. Jason Matthew Faulds: aged 32, of Cross Bank Avenue, Balby, drunk and disorderly, discharged conditionally for 12 months, £105 costs. Lee MacManus: aged 40, of Junction Road, Stainforth, possession of a class B drug, discharged conditionally for 12 months, £105 costs, order for the destruction of the drug. Kaya Mark McGrath: aged 23, of Ramsden Road, Hexthorpe, theft, £120 fine, £80 costs. Nathan Lloyd Morley: aged 37, of Wilberforce Road, Clay Lane, drink driving, £4000 fine, £125 costs, disqualified from obtaining a driving licence for 12 months. Alex John Benjamin Rooke: aged 29, of Ingham Road, Dunscroft, theft, £120 fine, £80 costs. Wayne Williams: aged 44, of Broomhouse Lane, Edlington, theft, discharged conditionally for 12 months, £7 compensation, £105 costs. Christopher William Headrige: aged 31, of Amersall Crescent, Scawthorpe, failed to stop a vehicle when asked to do so by a police officer, driving without insurance, driving without a licence, £120 fine, £115 costs, eight points on driving licence. Sharon Linacre: aged 58, of Christ Church Road, Town Centre, theft, community order, rehabilitation activity requirement, £135 costs. Colin Franklin Turner: aged 47, of Marshgate, Town Centre, attempted fraud, theft, fraud, 16 weeks in prison, £200 costs. Richard James Coulthard: aged 35, of The Pastures, Bawtry, assault, community order, rehabilitation activity requirement, unpaid work requirement, restraining order imposed, £100 compensation, £620 costs. Mark Stephen Gravil: aged 36, of Travis Close, Thorne, assault, taking a vehicle without consent of the owner, 26 weeks in prison suspended for 12 months, rehabilitation activity requirement, unpaid work requirement, restraining order imposed, £1,200 compensation, disqualified from obtaining a driving licence for one year. Julia Hargreaves: aged 42, of Staveley Street, Edlington, theft, assaulted a police constable in the execution of their duty, community order, drug rehabilitation requirement, rehabilitation activity requirement, £170 costs. 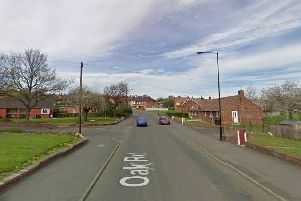 Joshua Mark Hancock: aged 22, of Maple Road, Mexborough, failed to comply with the requirements of a community order, order to continue, £40 fine, £75 costs. Sam Holmes: aged 28, of Copley Road, Town Centre, failed to comply with supervision requirements following a period in prison, £40 fine, £75 costs. Karn Richard Errington: aged 23, of Whard House, Wharf Road, Town Centre, theft, discharged conditionally for 12 months, £20 costs. Gareth Shaw: aged 36, of Thomas Street, Swinton, Doncaster, failed to comply with the requirements of a community order, £85 costs. Della Carroll: aged 22, of Morton Road, Mexborough, Doncaster, possession of a class A drug, discharged conditionally for 12 months, £105 costs, order for destruction of the drug. Gary Reid: aged 27, of Doncaster Road, Golddthorpe, criminal damage, community order, rehabilitation activity requirement, £170 costs. Scott Lee Dickinson: aged 26, of no fixed address, breach of restraining order, assault, community order, rehabilitation activity requirement, unpaid work requirement, restraining order imposed, £85 costs. John William Bortoft: aged 31, of Hickleton Terrace, Thurnscoe, Rotherham, using abusive language or behaviour to cause a person fear that immediate violence would be used against them, criminal damage, committed a further offence while subject to a suspended sentence, 12 weeks in prison, £115 costs.